Over the last six months the rupiah has gained more than 7% against the dollar (14,085 rupiah per dollar on 16 April), taking it to just 2% higher than it was a year ago. Over the same period, foreign exchange reserves have increased (by USD 9 bn) taking them back close to their levels of a year ago. They remain sufficient to cover the country's short-term external financing needs (1.3 times) despite the increase of the latter due to the sharp rise in the current account deficit. 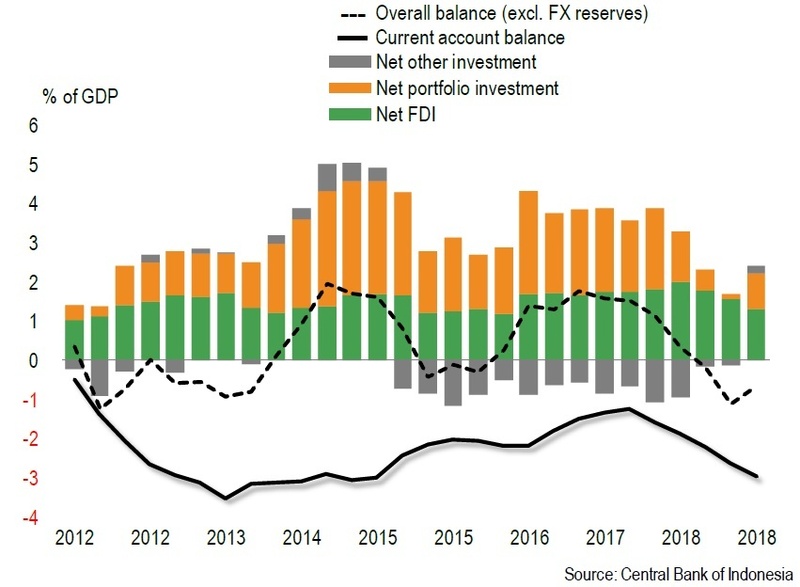 Although the figures on international trade suggest a sharp fall in the current account deficit in Q1 2019, the improvement in external accounts reflects mainly the return of portfolio investments. But this consolidation also reflects the country's dependence on volatile capital. Despite reforms, foreign direct investment remains low, and fell in 2018, reaching only 1.9% of GDP. One of the main challenges for the next government will be to make the country more attractive.